Medal of Honor Citation: For extraordinary heroism and valiant devotion to duty as commanding officer of Marine Fighting Squadron 214 in action against enemy Japanese forces in the Central Solomons area from 12 September 1943 to 3 January 1944. 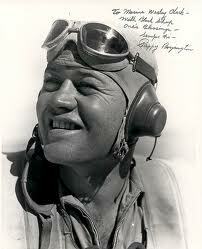 Consistently outnumbered throughout successive hazardous flights over heavily defended hostile territory, Maj. Boyington struck at the enemy with daring and courageous persistence, leading his squadron into combat with devastating results to Japanese shipping, shore installations, and aerial forces. Resolute in his efforts to inflict crippling damage on the enemy, Maj. Boyington personally destroyed 26 of the many Japanese planes shot down by his squadron and, by his forceful leadership, developed the combat readiness in his command which was a distinctive factor in the Allied aerial achievements in this vitally strategic area.